Out of curiosity – and with some extra time on your hands – you might surf the web and stumble on stories detailing the success of a single entrepreneur “changing it all.” Steve Jobs, Bill Gates, Michael Dell, David Packard, Google co-founder Larry Page, Yahoo! co-founder David Filo, and many more make up the tech glitterati. You know them as co-founders or CEOs. But what you might not know is that all of them were once product managers. In this article, we will define the role of a product manager in product development, the product roadmap, and its main features. You will also find common roadmap types with examples and some tips on roadmap creation. For deeper insight, check our material on product management as an organizational function. The misconception that a product manager (PM) and a product owner (PO) are the same role refers to the implementation of Agile methodologies. According to The Scrum Guide, a product owner is a member of a Scrum team, responsible for creating product value. The product owner develops a product backlog and writes user stories. In real-world practice, a PO constantly communicates with the engineering team, clarifying requirements. So, what is the reason for such confusion? Before Scrum was actually introduced, product managers used to take the product owner’s work, which led to the opinion that both types of managers are interchangeable. Moreover, there is no “product manager” role in Scrum. A PM is a profession, while a PO is a Scrum role. In today’s product development, it’s possible that the PM and PO have some shared responsibilities like figuring out specifications. But, in a nutshell, a product manager is focused on strategy development, while a product owner ensures correct implementation of it day to day. If you are interested in Scrum, check our article about Scrum best practices. A product roadmap is a high-level, strategic document that maps out general stages of a product’s development. The main purpose of a product roadmap is to tie a product’s vision in with a company’s business objectives. Product vision — what you want your product to become in the future. Strategy — an execution plan detailing what your company is going to do to meet the vision. Goal — a time-bound objective that can be measured by a specific metric. Initiative — broad themes that unite features that must be implemented to achieve a goal. Feature — an actual piece of a product that’s either part of functionality or a third-party application. Time-frames — dates or time periods for a certain goal or feature to be finished. As a rule, a product roadmap suggests only an approximation. Status markers — used to track the progress of work. Metrics — assistance in the measurement data-driven goals, e.g. churn rate or organic traffic. Creating a product roadmap is difficult and usually requires multiple people or even teams involved in production besides a product manager. Depending on the product you are developing and methodologies you are practicing, the number of teams involved in roadmapping may vary. Most often, you would have your engineering team, UX, sales, marketing, support team, operational team, designers, and testing team. Those are the people that will work on the actual product. Sometimes, a product manager builds multiple roadmaps of different types to present the information to internal and external stakeholders. Talk to your internal and external stakeholders, talk to your customers, look at the market and your competitors. Define your customer personas, listen to what salespeople are telling you, speak to customers themselves. Provide intelligence on the customer voice to the production team and management. Once you’ve aligned the vision across all stakeholders and participants, you have the required input data to begin working on your roadmap. A product roadmap is not a one-size-fits-all plan. The audience you have to present your roadmap to will be a predetermining factor for the format of your roadmap, its type, and the contents you should include in it. Determining the type of roadmap is a complex, and we will detail that in the next section. The format also makes an impact on your contents choice. The format you may choose can be more suitable for a specific audience. For example, a feature-based format is not suitable for the marketing department or management but is recommended for your engineering team. The format chosen will suggest the necessary items of information to be highlighted and which themes or goals should be prioritized on the timeline. Metrics will help to see an even broader picture and measure your progress. Depending on the purpose of your roadmap, you may choose metrics oriented to customer needs or business needs. As a source of relevant metrics, you may analyze the market and your competition or have recourse to an industry analyst. To learn more about KPIs and metrics used in Agile product development, check our fact-filled article. OpenProject is a free roadmap tool that allows you to create unlimited projects within a single user profile. OpenProject is an open-source product management software also tailored to the needs of Agile/Scrum teams. Roadmap Planner is another open-source product management tool for Linux. ProductPlan is the most popular among those mentioned, being used in such digital giants as Windows and Adobe. 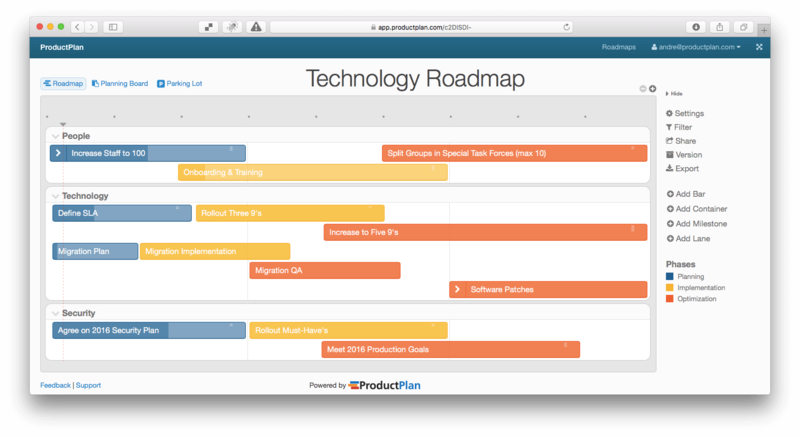 ProductPlan shares tons of roadmap templates for various purposes. You may also import items from Jira, Spreadsheets, or VSTS, which makes the planning process much easier. Aha! is another industry giant, used by Shutterstock, LinkedIn, and Dell. The integration list with other applications is impressive. Roadmunk is also on the list of top product management applications meeting all the necessary standards with good pricing. To preserve the functionality of your strategic roadmap, you have to focus on providing the general vision and strategy, not tactics. Your minor items of information are valuable, but your roadmap is a strategic document that has to be clear and easy to understand. For that reason, avoid being too detailed and including too much or unnecessary information. The second point here is the dynamics of your product roadmap changes. Your product progress will bring new features and goals. To keep track of them and convey the information to the rest of the stakeholders, a product map should be constantly updated, which means a gradual evolution with the product. A product roadmap can be tailored to a specific audience, type of information, orientation on different key points, and methodologies. Strategic points addressed to your internal team can be converted into completely different pieces of information for external stakeholders and for management. Depending on the type of the product, its quantity, a roadmap may include one or multiple products, or include products and features as units of information. Every product manager chooses the best variant for the roadmap. For that reason, there are thousands of custom categories that have no common base. This type of categorization suits a big company that plans to release multiple products across several markets. So, that is where a Strategy & Market roadmap comes in. Brian also includes Technology and Technology Across Product Roadmap types as the part of the product manager’s responsibility. But the spectrum of the product roadmaps used in regular product companies, digital technology companies, and by Agile practitioners is much wider. The types can be categorized by audience, industry, format, and purpose. Roadmaps are shared with various audiences to align the vision of all production participants. To simplify the conversation between different groups of people involved in a project, a product manager has to create multiple roadmaps to present the same information from different angles. This helps to initiate a discussion of necessary features and strategy. It also keeps the internal team in touch with the customer needs. The following scheme represents categorization by audience. 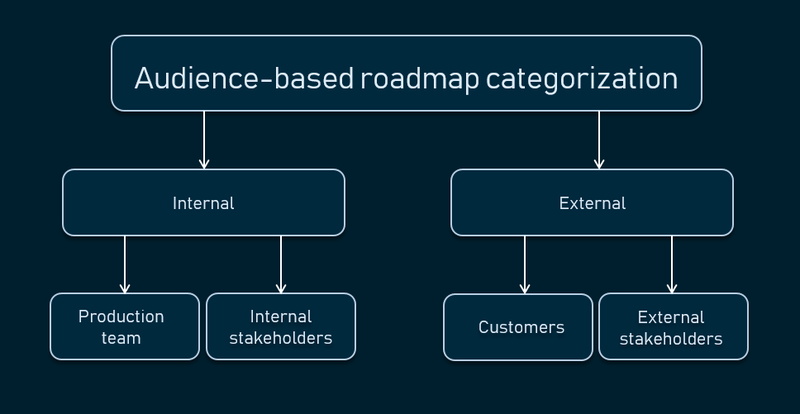 The audience of the product roadmaps can be internal and external. An internal audience is your executive team and production teams. The executive team usually consists of stakeholders from your company’s management team. This segment of your internal audience is interested in the detailed vision of the product and its strategic goals. Typically, those are strategic roadmaps that include details about customer growth, the product introduction to a new market, competitor analysis, and customer satisfaction. The production team may be complex and every part of it sometimes requires a roadmap tailored to their specific needs. An engineering team roadmap is likely to be a Technology roadmap. This type of roadmap is feature-based, as it focuses on technical details and is built around the actual features to be released, whether a search-bar, a registration form, or integration with some third-party service/application, or website redesign. It also defines strict deadlines and includes high-level information like goals. Your engineering team should be less focused on the vision of the product, but still, keep track of what other members of the internal team are doing. Sales team roadmap. A sales department is especially interested in the combination of product features and its benefits for customers. That’s why this type of roadmap should be concentrated on the product value. Theme-based format fits the best, as themes can show graphically which goal each feature serves. External roadmaps, as a rule, have a presentation-like format, as they don’t share any specific information about internal processes. External roadmaps should be easy to understand, visually clear, and share maximum information about the benefits for the customers. Most often roadmaps shared with the public don’t contain any deadlines. They commonly introduce approximate time frames and the succession of feature releases. The format heavily relies on the type of product roadmap that we mentioned above, as it will determine the type of contents and key-items used to build it. Nevertheless, the most universal formats are Goal-Oriented or a simple “GO” roadmap, Theme-based, and Feature-based ones. A Goal-Oriented format helps to keep all information grouped and clearly explained. Goals determine a reason for every feature to exist. A goal can be stated in simple words as “Increase user engagement” or “Make registration process faster.” By organizing the information around the goals, you will keep your roadmap high-level and make your strategy and vision easy to understand. A Theme-based format is similar to the goal-oriented one. The goal and theme concepts are close as they both answer “why” questions. The only difference is that themes consist of several goals at once. A feature is not a stable unit considering the changing market. Technological innovations and customer needs cause your feature set to change quite often. A feature-based format doesn’t provide high-level details, which blurs a general vision of the product, making your roadmap practically more difficult to maintain and harder to understand. Technology roadmaps or IT roadmaps are more low-level documents usually created to support the main strategic roadmap. They are used for the internal teams to formulate tech requirements. Technology roadmaps determine the use of a certain technology and help to allocate resources they depend on. Manufacturing roadmaps are created for the actual manufacturing of a physical product. The name is self-explanatory, as manufacturing roadmaps help to control manufacturing and set actual dates for a particular release. 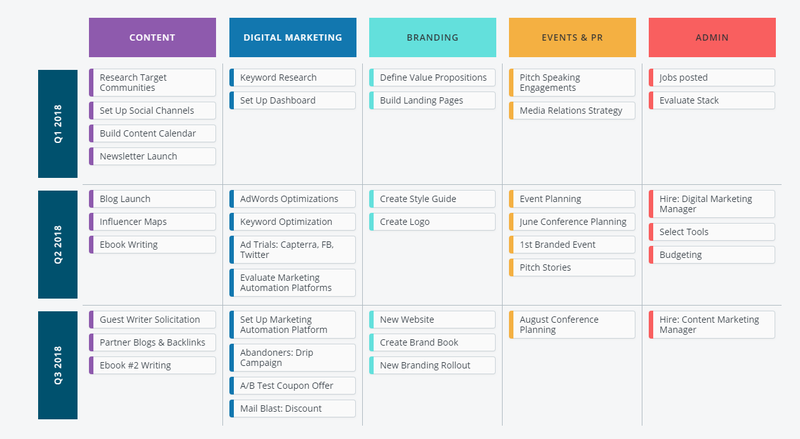 As we mentioned before, roadmaps can be created for different purposes. In general, the main purpose is to communicate the strategy and vision between people involved. But, there can also be additional options. A portfolio roadmap is used to communicate the strategy of a product line between executives and product managers. In companies with multiple products, it’s essential to see how each product evolves and how different products relate to each other to accomplish high-level business objectives. A market roadmap is a document that may be used if the launch of the product is planned across multiple markets. It’s mostly developed for the marketing department and internal stakeholders to plan the marketing strategy for single or multiple products. Market roadmaps are, perhaps, the most dynamic ones, as they have to capture the rapid changes in the market. Competitor or technological progress may cause significant shifts which will require strategy adjustment. A product roadmap in any of its forms still has to preserve the general key points of information. To avoid adding low-level information to the document, we can use two more artifacts supporting a strategic roadmap. A release plan is a document that sets strict release dates. Product managers mostly set floating timeframes for releases. While the goal of the product roadmap is to show the succession of product releases, a release plan presents more precise dates for a specific feature to be released. It’s also a normal practice to match development sprints with certain features or bug fixes. A product backlog is a Scrum artifact with a list of high-level requirements and features. 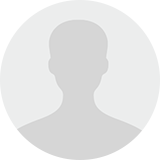 Backlogs are created by product owners and consist of user stories. A product backlog is basically a to-do list that defines product development at the tactical level. A technology roadmap is often used in digital product development as a separate document. It describes the “how” of your product on the technical level and covers technologies that should be used to meet the product roadmap. While a product roadmap keeps high-level descriptions and focuses on the overall business objectives, a technology roadmap shows which technical means should be used to achieve them. If you are struggling to find templates for your own roadmap, you may check the services mentioned above. Roadmunk gives a 14-day trial period and a bunch of free-to-use templates. ProductPlan also proposes various templates for different purposes you may try for free within a 30-day trial period. Or you may use our simple spreadsheets template for a theme-based roadmap. 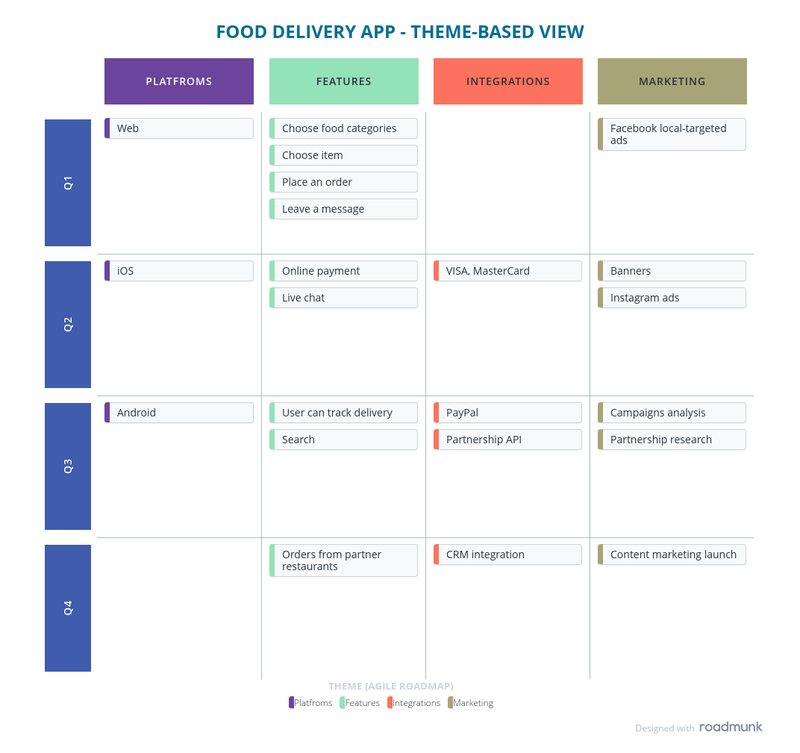 To have a basic reference, look at our examples of different types of roadmaps for the same food delivery application. These are illustrations showing structural differences in some roadmap types. The first example is a theme-based roadmap organized around different platforms and high-level objectives within multiple domains. The next one is a technology roadmap. As you can see, it contains technologies required for implementation of the given features and provides a more detailed technical overview at the same application development cycle. While it doesn’t clearly communicate the vision, different teams can align their understanding of the product delivery. And here is an example of an external roadmap presented to the customers. 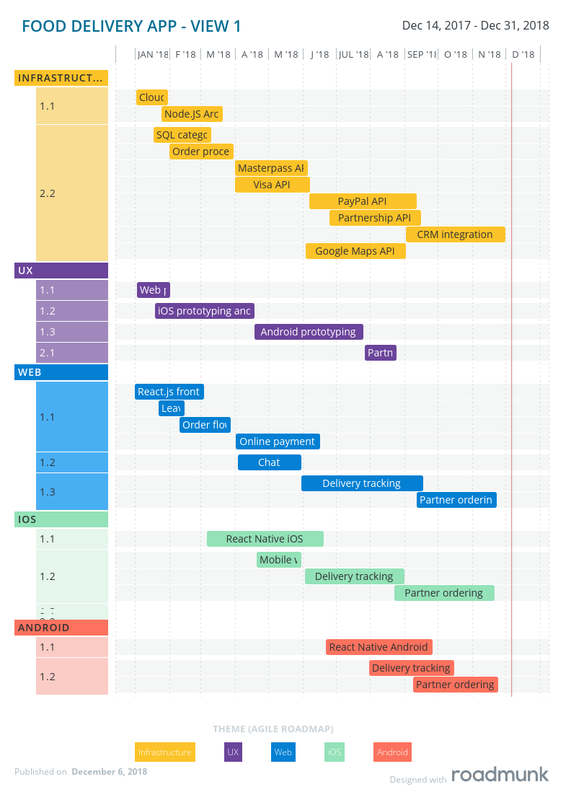 This type of roadmap represents major releases of the app functionality for the external public, so it doesn’t need many tech and practical details. A product is a revenue channel for many businesses. Without precise planning and maintenance, it will fail, no matter how mature your product is. 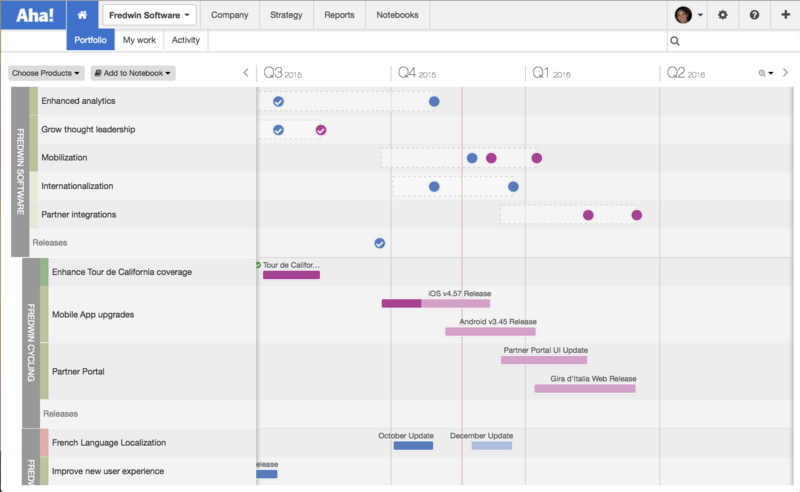 This makes a product roadmap an irreplaceable tool for any product development team. Without any doubt, roadmapping is time-consuming. According to the ProductPlan’s annual report 2018, the most tedious product planning tasks are determining initiatives (34 percent of respondents), prioritizing and scoping them (26 percent), and gathering input data (17 percent). But templates and cloud-based applications for roadmap creation can make your life as a product manager a lot easier.